This year's Fall kitchen arrangements once again are larger-than-life, filling entire tables with flowers and vegetables grown on site. 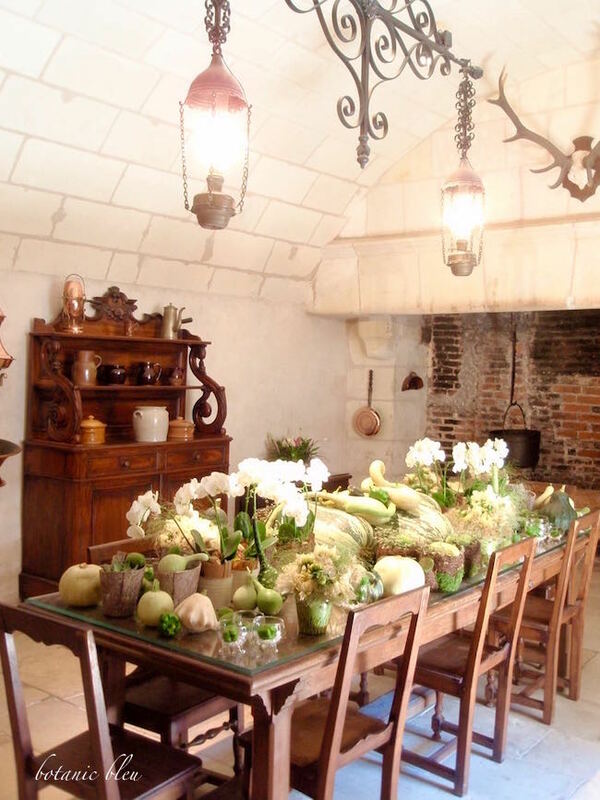 The room is pure French Country with its massive stone walls and fireplace, long wooden kitchen table, simple wooden chairs with just a touch of a curved design, French hutch, scrolled ironwork, hanging lanterns, and mounted antlers. Studying this room is a lesson in what French Country design is. The upper rooms of the château are more opulent with tapestries, massive elaborately carved stone fireplaces, elegant velvet bedding, and carved wooden ceilings with gold accents, but the kitchen rooms, where the servants worked, portray French Country. 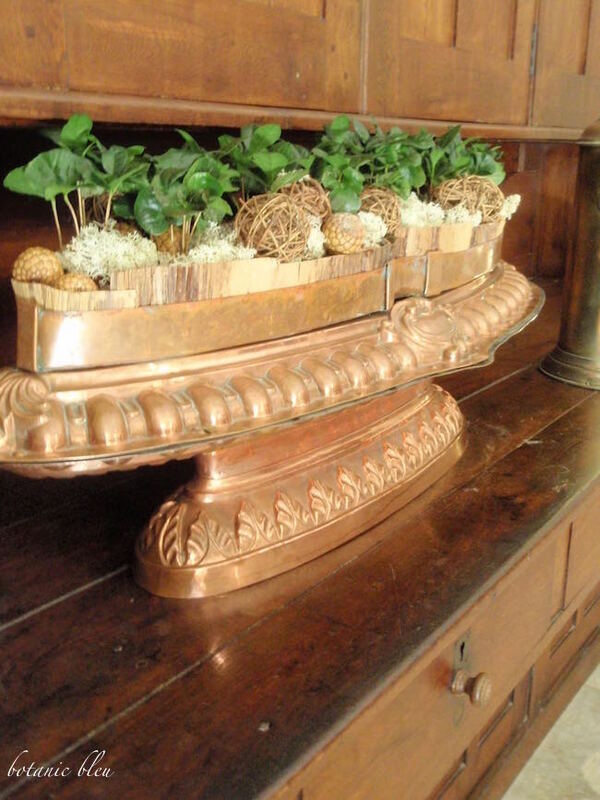 Synonymous with the phrase French Country is the French flair for combining elegance with everyday objects. 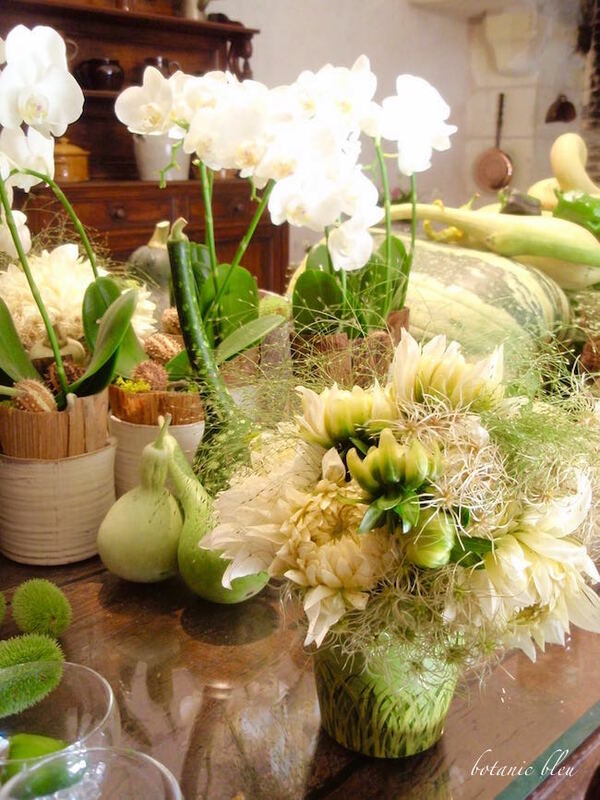 This Fall table pairs white orchids with green squashes and gourds. Also true to French Country floral design are the vine and moss topiary watering cans filled with kiwi, squash, and creeping vines. A month's worth of floral design lessons can be learned from this table arrangement. Begin with the glass top that protects the wood from the raw vegetables and plant moisture, but also allows the table to be seen. 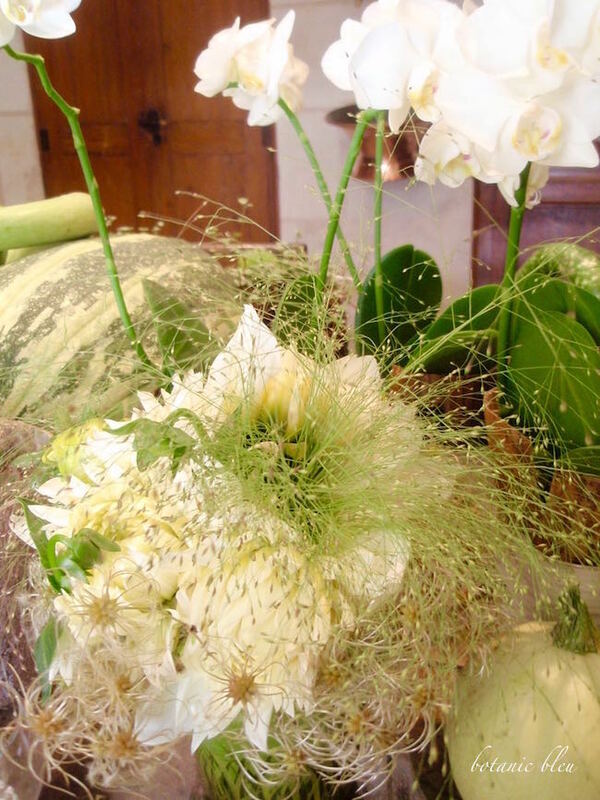 Texture comes from the green spiky kiwis, wispy plants mixed with the luscious dahlias in the short green vase, thin wood shanks in the white metal containers holding the orchids, and the varied sizes and shapes of the gourds. Fall white flowers include the orchids, dahlias and what looks similar to nigella, also known as love-in-a-mist. The flowers and vegetables repeat the same greens and whites which unifies the table arrangement. More white, green, and natural elements fill a footed oblong gold container sitting on another humble French Country hutch in the same room. The gold container is unexpected in the humble kitchen spaces, and probably was used in the upper rooms. Another room in the kitchen spaces has a second long wooden table filled with a Fall kitchen display with more vibrantly colored flowers, squashes, and pumpkins. The armoire in the background is simple in design which is expected in the servant areas of the castle. 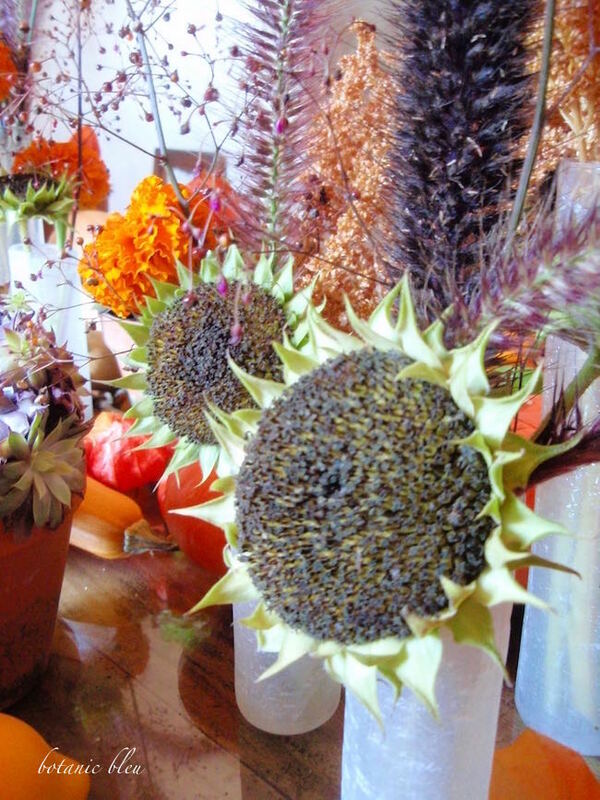 Unusual sunflowers and seed pods came from the castle's working flower and vegetable gardens. 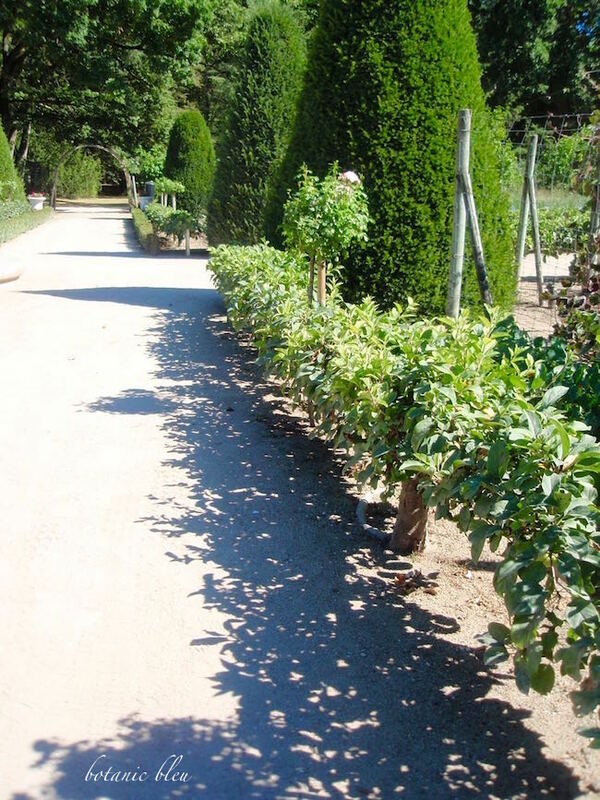 A short espaliered border of apple trees encloses the vegetable and cutting flower gardens. Small pebbles, a traditional French drive and walkway medium, cover the surface of the garden's pathways. The gardens include herbs like these growing along side the large leafy green vegetables. 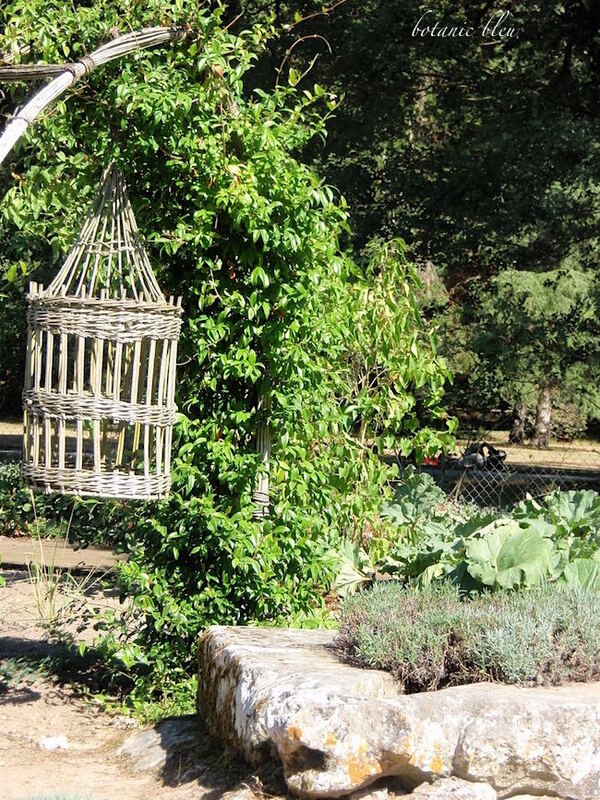 Birds roam freely on the castle grounds today, but the vintage hanging birdcage is a reminder of the days when birds were caged. 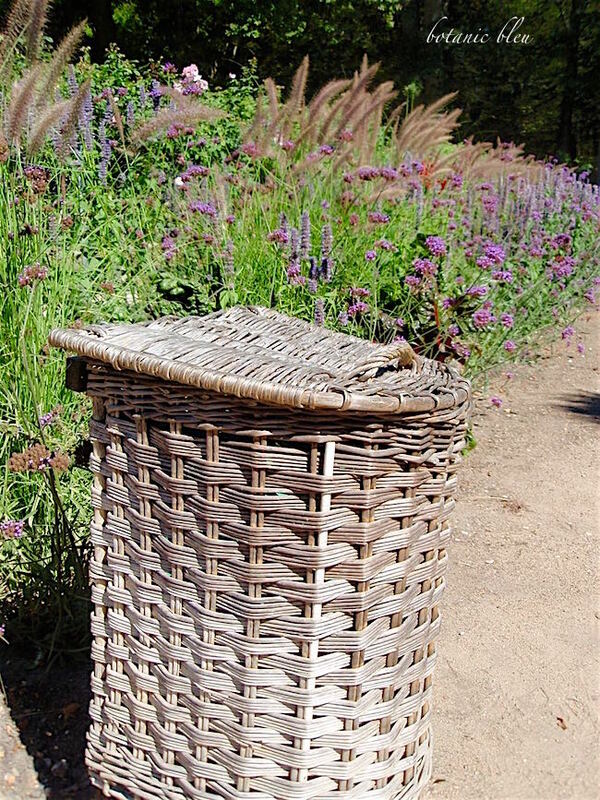 Large woven baskets are also part of traditional French Country design. In the background are Fall flowers and grasses that will be used in floral arrangements in the château. Chenonceau is elegant with its white stone walls and dark blue tiled roofs, a color combination that is timeless, enduring as a favorite combination for over 500 years. Potted topiary trees in large white containers line either side of the front walkway and are classical French garden style with their trimmed shapes and symmetrical design. 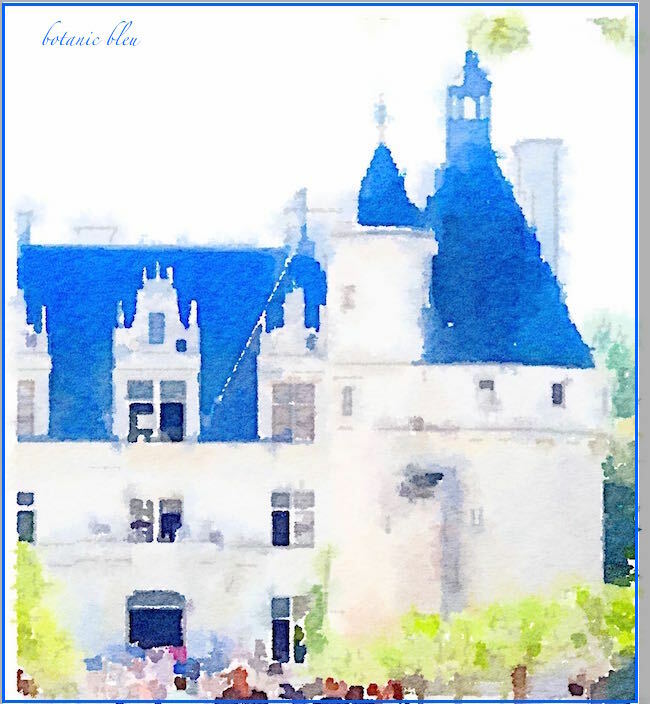 This photo of Chenonceau was enhanced by the Waterlogue app on my iPhone and illustrates another use for a watercolor rendition of travel photos.... disguising anonymous tourists visible in your photos. 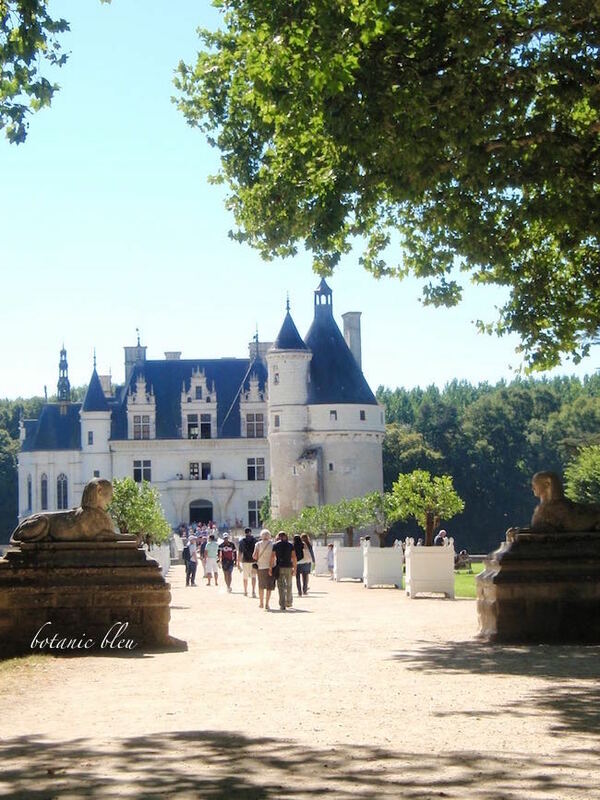 Now you can view them as simply other Chenonceau admirers that blend into the foreground of beloved Chenonceau. 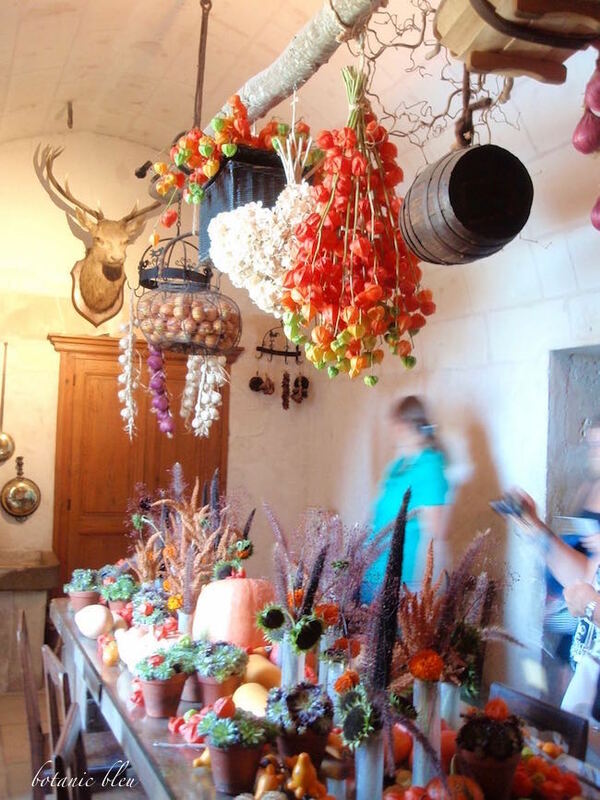 What was your favorite part of Chenonceau Château's spectacular Fall kitchen arrangements? 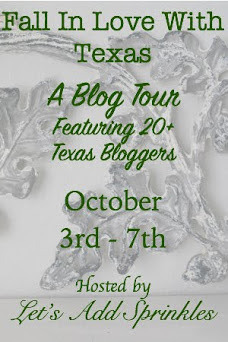 Katie at Let's Add Sprinkles is hosting 20+ Texas bloggers for a Fall In Love With Texas blog tour the week of October 3-7, 2016. Mark your calendars so you do not miss any of the Fall inspiration from my good friends here in Texas. Thank you for sharing this beautiful part of your trip, Judith! I almost feel like I got to visit Chenonceau Chateau myself. I'm in love with those vine and moss watering cans. Judith! These photos take my breath away! They are beautiful and allow me to walk into your experience there. I think first fall kitchen photos are my favorites, but each room (indoors and out) is amazing! I'm happy for you that you had this experience. Can't wait to see more trip photos! Judith, this is lovely. So interesting too, as I have been watching a bit of the series Reign. It takes place during Henry II's reign and has as a main character Mary, Queen of Scots and the Dauphin Francis. There is a bit I fast forward through, but otherwise it is an interesting series. Also, the character of Diane is in this and her son with Henry. Oh how wonderful! I love the table and the chateau is beautiful! Hi Judith, it's been awhile as I have been so busy and not keeping up with some of my favorite blogs, like yours here. I love every bit of the chateau and what about the gardens ?? What beauty they inspire, the beautiful,center pieces create atop the table is filled with a harvast of beauty. I have to say being into lanterns for quite some time now, they always catch my eye. These has lanterns are wonderful, I have just wired a French Lantern from the southern Calif beaches in Malibu where a very old French lantern was a piece I picked up at a beach side estate sale. The home was being renovated and it was my fortunate day to have been tipped this lead. In my post you will see what I have created lighting wise with the lantern. I think the large basket in the last photo may have been used to collect grapes from the vineyards on the grounds??? It looks like some I have seen here in Europe. Thank you for sharing a portion of your travels with us and this stunning Chateau. The perfect combination as you stated of everyday living and elegance. Beautiful inspiration Judith-I am soaking it all up while I sip on my French coffee. Oh Judith, You are certainly a wonderful tour guide and I so enjoyed visiting the chateau with you. Thank you for taking us along on your visit to the Chateau. 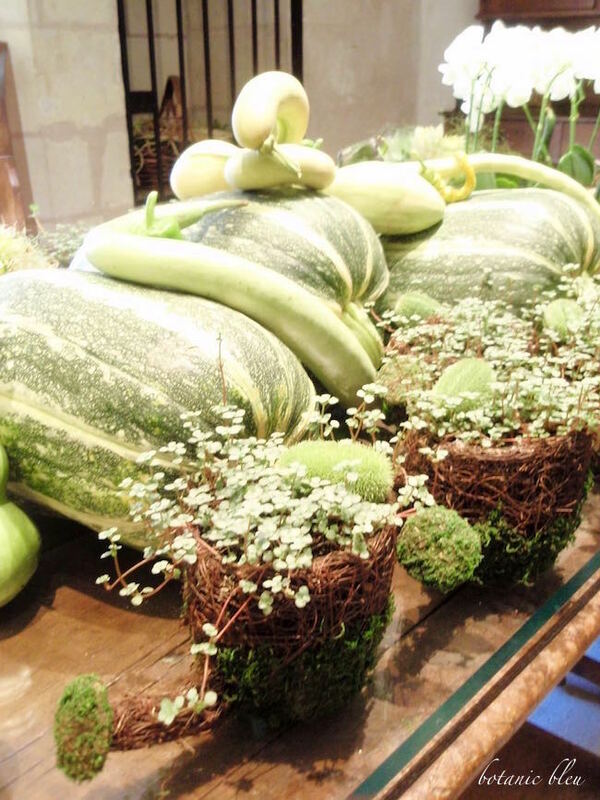 What amazed me, as I viewed the tables arranged with vegetables and flowers, was the fact that all the materials were already on hand and then so artfully arranged. Ahhhhh, to have the vision to create something so beautiful! Judith, such beautiful photographs! Thank you so much for sharing your trip with us! Happy Fall, and I hope that you have a wonderful day!!! Judith, your photos just get more beautiful and this takes the cake. 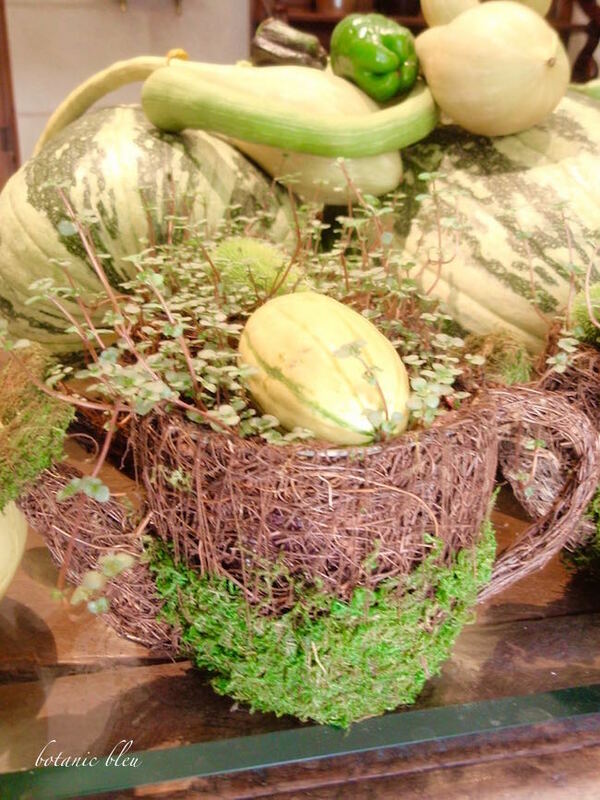 Love the green and white flowers and vegetables, and the orchids, who knew they would look so good with Fall gourds? What a beautiful chateau! You do us proud back home in Texas! Wonderful post, Judith! I am in Germany and have very limited time but this is such an impressive post. Would love to have time to study it more and discuss with you. Great inspiration! Oh, I know you loved this chateau! Nice to meet you, too! Welcome to Botanic Bleu. Gorgeous photos and superb commentary! I visited Chenonceau in 1999, and your post has me longing to return. Just amazing! This is so beautiful Judith. Your travels make me want to pack a bag and go somewhere!! What beautiful tablescapes!! I love the one with color the best ;) You took some beautiful pictures, thank you for sharing at TaDa Thursday!!! Just incredibly wonderful. The ktichen table is now on my dream list and the scenery, is just overwhelmingly wonderful. Oh wow! Both tables are just incredible. I love how they have incorporated produce with the floral! Thanks for sharing it with SYC. WoW! The French really do it large! That table arrangement is breathtaking. I love it. How beautiful! Thanks for sharing at Home Sweet Home! I will feature this today at Home Sweet Home! THanks for taking us to the Chateau! Judith, Chenonceau is my favorite French chateau. I fell in love with it years ago when it was featured in a movie (which I can't remember), then when I finally saw it, I was entranced. I remember walking down a long passageway over the river. Sigh. Judith, we visited Chenonceau in the fall of 2011. I need to pull up my photos and compare the table decor because I have images from the same rooms. Like you, I was impressed with the amazing flowers and centerpieces. Thanks for taking me along and sparking memories of my own. My husband and I rented a car and did a driving tour of the Loire Valley several years ago. We visited many but my favorite château was Chenonceau. We were there in November and the kitchen display was more of a winter theme along with all the floral arrangements throughout. Every fireplace had a roaring fire and made for a wonderful visit. I would love to return! Thanks for this beautiful post.......Visiting by way of Courtney at Home Sweet Home. So lovely! I can't believe the tables, they are just so beautiful. I am going to send this post to my mom, she will really appreciate. She works for a very quaint and popular textile company in the south. She might get some inspiration for one of the tables for guests looking to update furntirue and things.